You are a stranger in a strange land. You awaken in a hut. You have no memory of who you are or how you got here. The spirits of the dead beckon to you. They speak of dire portents, powerful sorcerers, ancient relics, and forgotten worlds. Solve puzzles and explore a bizarre landscape in this entirely original adventure game from Copper Octopus studios. Redworld is an entirely original world of fantasy unlike any other. Wander the red desert and solve ancient puzzles left behind by long forgotten civilizations. From tombs to caves to bizarre cities, Redworld is filled with strangeness. Rendered in gorgeous pixel art and programmed in a SCUMM-like engine, Redworld provides for hours of unique gameplay and entertainment. Numerous puzzles await you on your quest, requiring you to think on your feet. Challenging without being frustrating, Redworld is sure to find a place in your adventure game library. In Redworld, you take the role of a nameless wanderer, brought to a world between worlds in a desperate quest to save the afterlife. 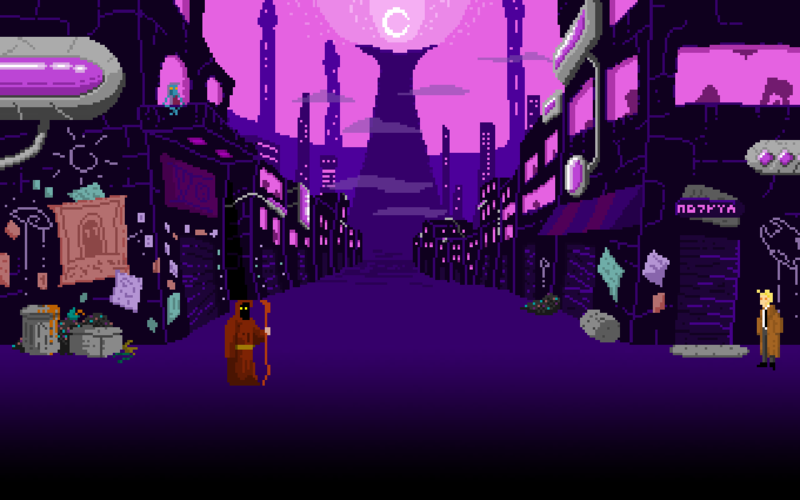 An ancient creature known only as The Sorcerer has taken over the planet and stolen the moon, using it to capture the spirits of the dead so he can power his city with their souls. You are the only hope this alien world has. Solve puzzles in the traditional adventure game style as you journey through the Valley of Trials and through the Red Desert. Meet bizarre creatures and individuals in your travels. Are you brave enough to journey through this unusual world and face the evil that awaits you?